Sultry and steamy are the norm for July summer mornings in Austin, but the open blooms of Jimsonweed, Datura wrightii, deliver a dose of cooling bloom to the garden. 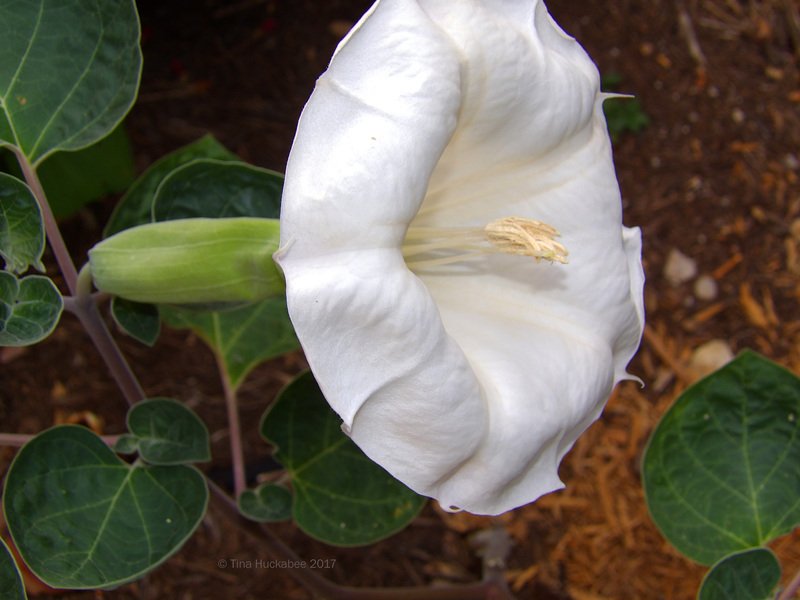 Large and glowing, Jimsonweed flowers open at night and close by mid-day. These two petulantly refused to greet me as I trundled along the path for closer look and a breath of their intoxicating fragrance. 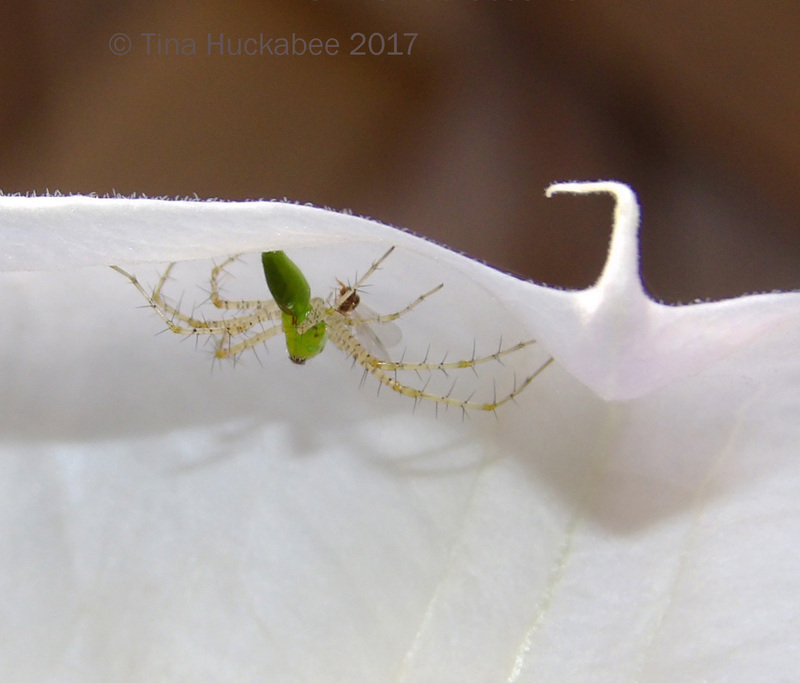 A Green Lynx spider, Peucetia viridans rested on the creamy expanse, clutching what looked like a breakfast tidbit. 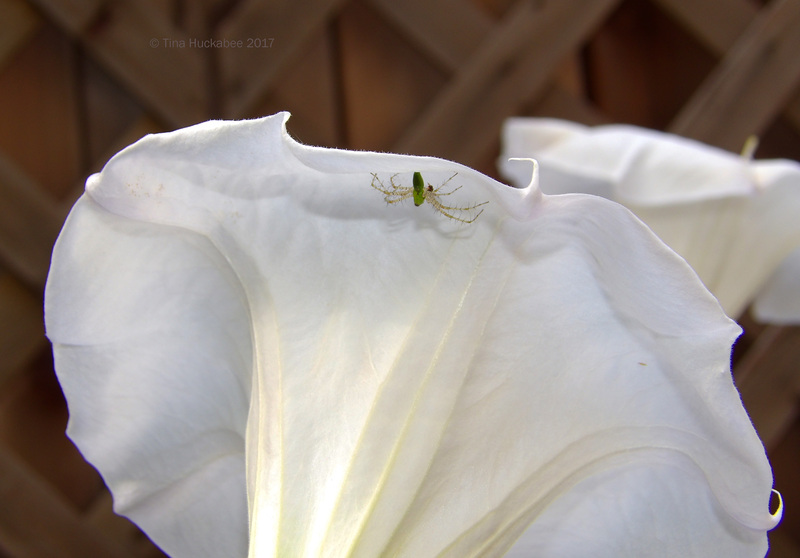 As I leaned in for a look, Ms Lynx skittered to the underside of the petal, prey in hand. We briefly played photographer/spider hide-n-seek, but I succeeded in snagging a couple of photos of her–and her intended meal. The wings of the victim are visible and I suspect the spider’s snack is some sort of small fly. I didn’t figure out what she captured; it was probably a small bee, gnat, or fly, but she certainly wasn’t going to share with me, nor did she want to dine while I was loitering around her choice of dining establishment. 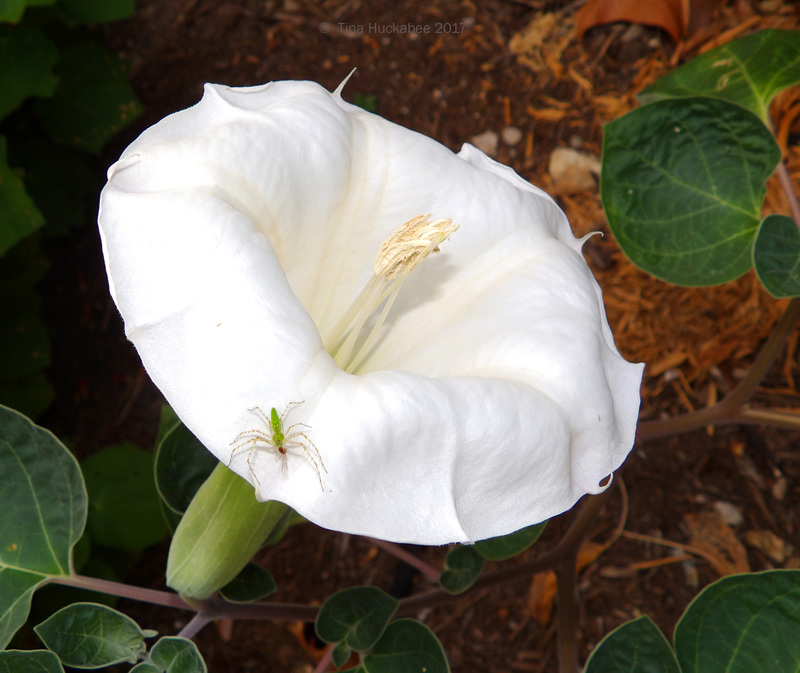 The spider proved lethal for its winged prey, but Jimsonweed (also known as Sacred Thorn Apple, Thorn Apple, Angel Trumpet, and Sacred Datura) has always been recognized for its toxic properties–all parts of this tough native are poisonous. Southwestern Native Americans utilized the narcotic qualities of Jimsonweed for religious ceremonies, but if prepared improperly (I don’t know what improperly means in this context), the dosage is fatal. Reveling in the heat of arid summer, my one shrub blooms from July until September, typically with 5-10 flowers each week. 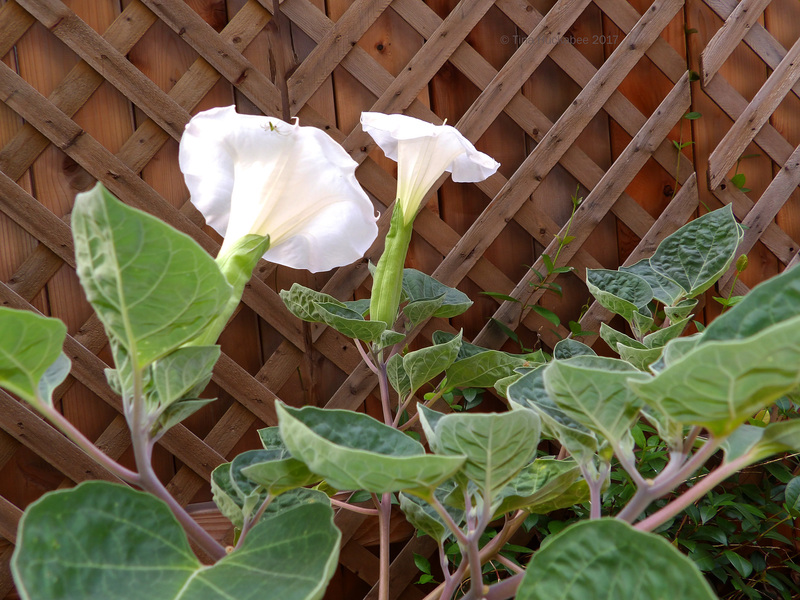 If Jimsonweed grows in full, blasting sun, the plant flowers more, and for a longer period of time. I’ll need to pop out at night during the next set of blooms and perhaps I’ll observe a pollinating moth. Until then, I’ll stick with coffee and some fruit for my breakfast and leave the spiders to their own meals. 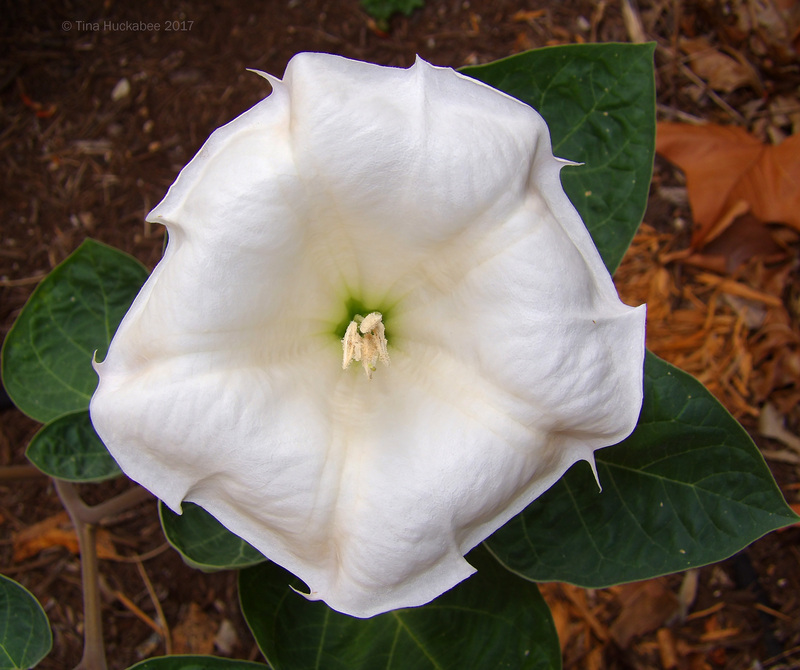 This entry was posted in Biodiversity, Datura wrightii, Jimsonweed, Native Plants, Native Plants Gardening, Uncategorized by Tina. Bookmark the permalink. These are wonderfuls shots. Nice job! Gorgeous! Have you ever been to the Edison Ford Estates in Ft. Myers, Fla.? Mina Edison designed an amazing little garden that looks great during the day, but also includes blooms that glow in the moonlight. I think Datura was one of the plants included. Next time I visit, I’d like to see it at night. Great captures! Thanks, Beth. I haven’t been there, but it must be gorgeous. I’ll bet Datura grows and blooms beautifully in Florida. The only other night bloomers I grow are four-o’clocks. I make an effort to see them at night, but mostly, it’s in the early morning light that I catch a glimpse. Truth be told, I enjoyed your post on the same beauty and it inspired me to post! So, thank you! A beautiful flower. And it tolerates your summer sun? Tina is a beautiful flower. I did not know her. Is it toxic, too, when you touch it? The photos are beautiful. The green spider had a good breakfast! Enjoy your breakfast Tina. Have a good week without too much heat. Greetings from Margarita. Thank you, Margarita! The Datura can be touched, but it’s wise to wash one’s hands afterwards. I typically snip off the blooms once they close, though the seed pods are quite beautiful, too. You also have a good weed–and I hope it’s not too hot in Spain! Nice shot of the little spider! Thanks, Janet. She finally decided to sit still for the shot, no doubt with the hopes that I’d leave her alone to eat–which I did! A friend has datura in her garden, but she lives in the hill country, and I’ve only seen it in bud, never in bloom. At least three times, she’s called me the day after I’ve returned home and gloated, “It’s blooming!” Sigh. 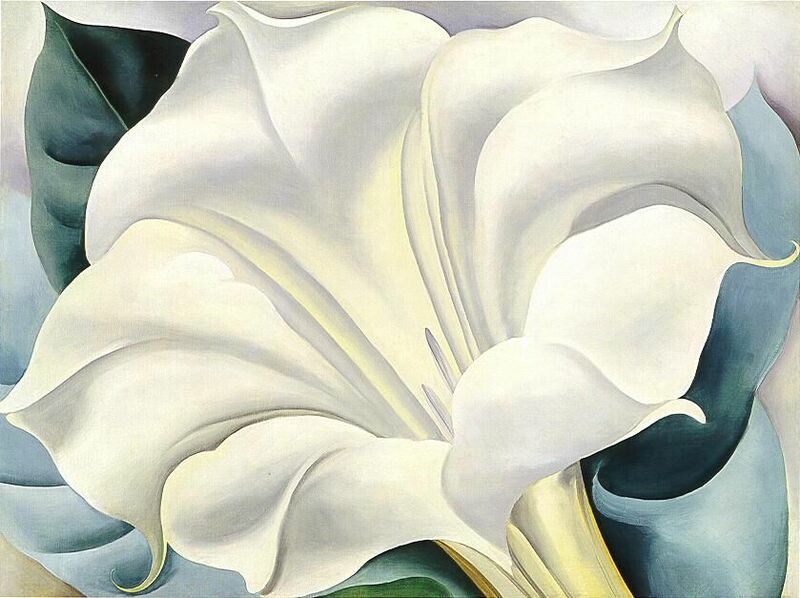 Long before I saw one of the plants, I fell in love with Georgia O’Keeffe’s paintings of the flower. Maybe this will be the year I finally get to see one for myself. The spider’s a great addition. I had to study a bit to see the difference between this and a crab spider (?) I found, but I think I’ve got it — the legs tell the story, among other things. I don’t know if you have a place in your garden, but if you’d like some basket-flower seeds, I can provide them. I decided to do a little exploring of the seed heads, and ended up discovering how easy it is to collect their seeds. Now I have two buckets filled with seed heads, and another little project. If you’d like some — or have a friend who might like some — just let me know. The datura blooms are a quick piece of work, but so worth it if you can catch a glimpse. Mine don’t bloom as much as others I’ve seen, but I’ll take what they give! I think the lynx spider also has a longer body, in addition to legs that go from here to there. 🙂 And YES! I’d love some basket flower seeds; they seem to grow in part shade (fingers-crossed!) and that situation my garden has in spades. Contact me and thanks so very much! They will grow in part shade. Here’s a photo of some I found growing around a tree. They all would have been shaded a full half of the day, and they were doing just fine. Looking forward to these beauties in the garden! I love these flowers too… but with the drought so severe and the intense above average 90 – 100 degree heat in Northern New Mexico I am finding that the plants do better without full sun. Hi Sara! Yes, I would agree with that as well. In fact, I’ve lost my one datura because it just couldn’t handle the full sun and I don’t supplement with water all that much, so I’m not surprised that you’d have issues with the plant in heat and drought. I loved mine, but I only got a hand-full of blooms each summer. I’ve planted a Gregg’s mistflower and it’s much better for that situation. In areas where the sun is intense – water and shade seem to make all the difference! We have a bunch of wild ones in the arroyos but those roots go deep… These flowers need water and often this requirement goes unsaid.